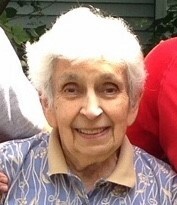 Gloriette (Lavallee) Bellerose, 89, passed away on December 5 in her home where she lived her entire life. Gloriette was the daughter of Marie (Capistrand) Lavallee and Dennis Lavallee. She graduated from Notre Dame high school in 1947. Before marrying her husband Richard of 44 years, and raising a family, she worked as a secretary at American Optical, and then as a teller at Southbridge Savings Bank. Later she worked at Sacred Heart Parish (where she was a lifelong parishioner until the Church closed in 2011, a loss that affected both Gloriette and Richard deeply) as a secretary and organist. Gloriette was an avid reader, crafter (especially embroidery), card player and pianist. She enjoyed nature, animals of all kinds, and later in life, the joys of being a grandmother to her 3 grandsons, taking every opportunity to share with them her love of music and family. Gloriette is preceded in death by her husband Richard, who passed away in September of 2004. She is also preceded in death by her sister Rachel, who passed away in 2003. Gloriette leaves 2 daughters, Colette Bellerose of Southbridge and Danielle Hankey of Sudbury; a son-in-law John Hankey; and three grandsons Ben, Jack and Kyle. She leaves a nephew Barry LaCroix of Ludlow, and his 2 sons Michael and Steven LaCroix. In lieu of flowers, the family suggests a donation in her name be made to Community Cat Connection of Webster www.CommunityCatConnection.org or the animal rescue society of your choice. Funeral services will be held at St. Mary’s church in Southbridge MA at 10 a.m. on Thursday, December 13, preceded by visitation at Sansoucy’s Funeral home at 9 a.m. Burial will be at Old Notre Dame cemetery.